Home music #Entertainment: Jay-Z Says Beyonce Is Pregnant Again! #Entertainment: Jay-Z Says Beyonce Is Pregnant Again! This is good news to fans of the couple, who have been heavily rumored to be splitting over the past few weeks. 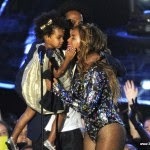 Beyonce, 33, and Jay Z tied the knot in April 2008 and welcomed daughter Blue Ivy in January 2012.